Gregg Child at Northrop and Johnson in Fort Lauderdale tells me that his central listing, the 26.2m motor yacht Heritage, has just been sold with David Weist at RJC Yachts introducing the buyer. 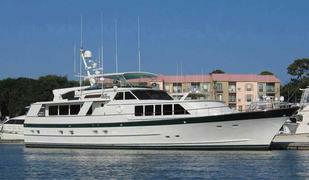 Heritage was built by Burger in 1987 and has been used as a family cruising yacht. Last refitted in 2007, this superyacht has classic Burger lines and construction, and one of their most striking interiors with light birds-eye maple with cherry trim, custom marble counter tops and tambour doors. The layout has the master and two guest staterooms all the way aft, and the two crew cabins forward, with the engine room between, ensuring privacy for both guests and crew. The asking price was $1.895 million.